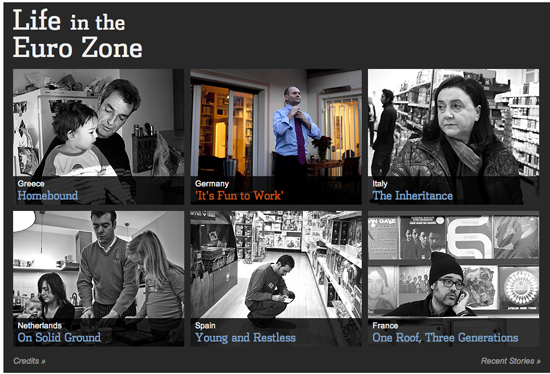 So we’re covering the Eurozone meltdown. Every bit of it. The drama as Governments clash and life-savings are lost; the reaction from world leaders, austerity measures and protests against austerity measures. Every day in the Wall Street Journal, there are charts on jobs loss, declining GDP, interest rates, plunging world markets. It is incremental. It is numbing. The Page One editors call a meeting to discuss ideas for year-end coverage and as we leave the meeting I find myself wondering: what must it be like to be living through this? Is this like 2008 when I was laid off and dark news was incessant? We talked about jobs and work and money every night at dinner nearly forgetting how it might upset my daughter. And weekends, they were the worst. I tried to deny the fear that seemed to have a permanent grip at the back of my neck and the anxiety tightening my rib cage. Is this what was it like right now to be a family in Greece? In Spain? 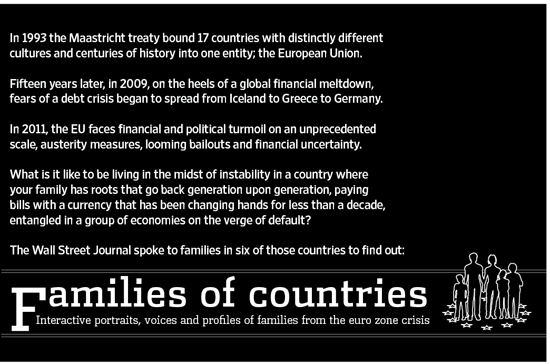 I turned back and followed Mike Allen, the Page One editor into his office and pitched the idea of telling the crisis through families in the Eurozone by looking first at the data, finding demographic profiles to understand what made up a family and then surfacing that along with pictures and interviews‚ audio of the generations. We’d use beautiful portraiture, the voices — and the data. Back at my desk, I wrote a précis and drew a logo. The next three weeks I chased numbers: metrics on marriage, mortality, family size and health spending. I read up on living arrangements and divorce rates, looked at surveys on well-being and savings rates. I browsed national statistics divisions, called the UN population bureau, the IMF, Eurostat and the OECD until I found an economist who had spent his career tracking families. He led me to a scholar on family composition. She pointed me to white papers on my topic. But first the data. Mornings I’d export data into spreadsheets and make charts to see trends: savings shrinking, pensions disappearing, mothers returning to work, health spending up along with government debt and unemployment. Afternoons I’d look at those data in clusters, putting the countries against each other to find stories. I did this for a week before I got lost in the weeds and started to doubt myself. Maybe this was the wrong approach. Maybe it wasn’t about countries, but it was about fathers and mothers, and children and grandparents. The data grew. And shrank. Sometimes I spent hours gathering information only to find out that it told me, well, nothing. That I had dug up the entirely wrong set of numbers. Sometimes the data were just too old. And then the data grew again as I realized I still had questions, and I didn’t understand the families. I needed to see it, to shape it. So I made a quick series of graphics in Illustrator, and began to arrange and edit them. As the charts emerged, so did a cohesive picture of the families. We launched. I called each reporter. I sent them the charts, the broad pitch and an open invitation to find stories that they felt were meaningful, that would bring the crisis closer to our readers. 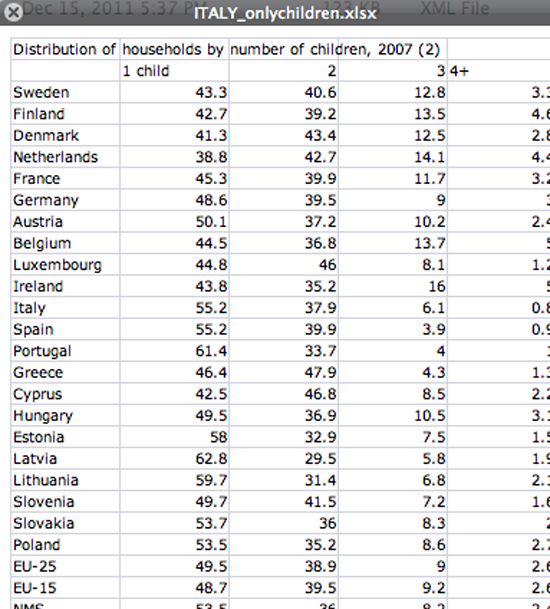 We needed a small family in Amsterdam, and larger ones in Spain and Italy. We wanted to hear from multiple generations to see how personal history shaped responses. From here on in I would be up early to check my email to be mindful of the time-zone gap. The reporters came back with lovely subjects, summaries and surprises that I hadn’t anticipated. For photography we knew we wanted portraits of the generations. Matt’s vision of was to have his photographers follow each family member through a day in their lives. He chose visual journalists who had covered the world, covered news and even covered war. Matt wanted each shoot to end at the dinner table. Sam suggested we include the menus. From here it was a question of waiting to see what story the photos told. Waiting to see what the families said. We designed the look of the interactive. I stole a palette from a Tintin novel, we worked through the interaction. And when it was all together and we had storyboards, we added back in some, not much but some of the original charts. Just enough to punctuate each story, just enough to harden the themes. The data became a pause in the story, a way to switch gears. In the end, the data were the people, they were the photographs and the stories. They were what was framing each narrative and driving the tension between the countries. By the time we published, right before the New Year as we were all contemplated what was on the horizon, I knew all the family members by name. I still wonder how they are now. And if this doesn’t seem like a data project, that’s fine by me. Because those moments which are documented in Life in the Eurozone‚ these stories of sitting down for a meal and talking about work and life with your family was something we were able to share with our readers. Understanding the data is what made it possible.